We are so excited to welcome back Rob Shaeffer! A longtime Hastings resident who recently moved up to the Berkshires is not only coming for a visit this Saturday, he's bringing some Massachusetts goodies with him! Rob will be at the market on Saturday with Hosta Hill's lacto-fermented krauts, hot sauce, and more. We're huge fans Moss Cafe in Riverdale and immediately thought of their avocado toast with pickled onions when he heard Hosta Hill was coming. 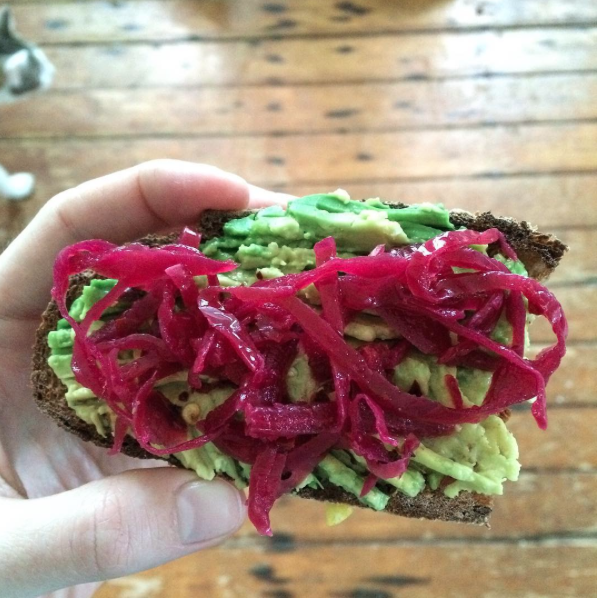 For a market version of the toast, try Hosta's crimson kraut atop a bed of avocado and warm bread, pictured below. Another hearty welcome goes to Alex and his crepes. After a lovely summer in France, he is finally back under the tent and behind the grill! We've been jonesing for his lemon sugar crepe! Wil Hi Farm is at the market this Saturday. Remember, they are only in Hastings once a month. Stock up on your ground lamb and stew meat- the weather will turn again and you'll crave a warm shepherd's pie or fall stew soon enough. Dragonfly Granola will be serving up parfaits with Sohha Savory Yogurt and market berries. It's the perfect size for eating while browsing at the market. While you're there, pick up a bag of granola for those hectic school-day mornings. It's easy, fast, and nutritious. We're happy to have Broken Bow Brewery return. Wonder if it's too hot for their Pumpkin Spiced Oktoberfest? 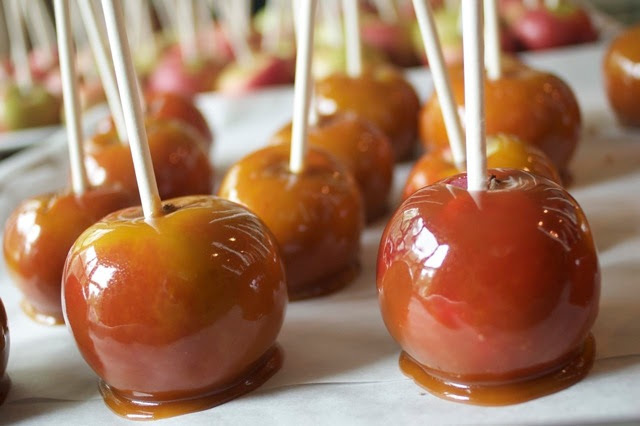 La Petite Occasion is also returning after their summer hiatus with caramel apples,minipaks and a new flavor to boot - Montauk mocha made with Montauk salt company see salt. P.S. Hastings is brimming with activity this Saturday. After the market, head to Penny Lick's birthday celebration at 11am. They have a magician, ice cream, and more. Take me to the River is also this weekend with an amazing line-up of bands and activities.